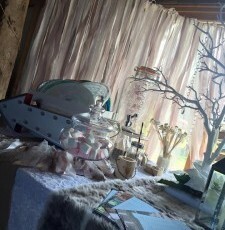 Our handmade tassel backdrop looks great hung from beams, trees or on our backdrop display stand. Choices are limitless! Made up of a mix of fabrics, lace, chiffon and ribbon this backdrop is great for a top table, photo-booth, or suspended in the trees outdoors. Tassel bunting also available.